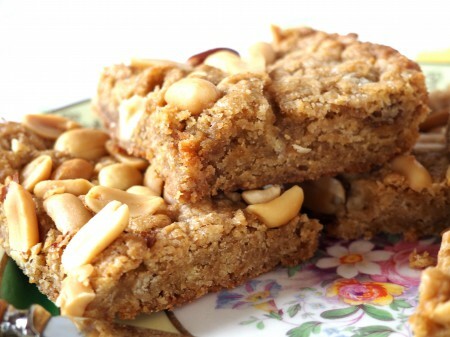 These little squares of peanutty goodness disappear fast! I have a large and ever growing cookbook library, and try not to buy more now unless they are something really different. But, browsing through Indigo one day I came across the cookbook Sweet well known Los Angeles baker and confectioner Valerie Gordon. All the recipes looked very interesting, but in particular I was intrigued by the salted caramel blondie recipe. Sooo…, my library expanded again, and I have to confess this is not the first time I have bought a cookbook for just one recipe! Despite buying this mainly for the one recipe, there are so many others I want to try, this is a delightful cookbook, well written, beautifully photographed, and with interesting technique and ingredient combinations. 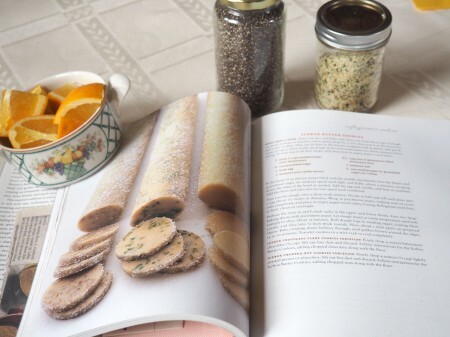 I can't wait to try the Apricot Basil Cream Galettes. 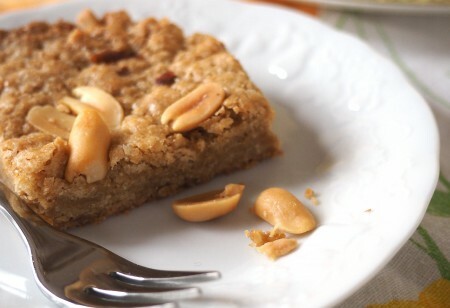 The recipe below is a gluten free adaptation, a little less sweet than the original, and without the chocolate chips because I wanted the peanut flavour to shine through without competition. I warn you, these are delicious, and I now freeze them so we won’t eat the whole pan at once. Unless someone told you they are GF you would not know; they are as delicious as any wheat flour recipe. Chewy or a little crunchier, just vary the baking time. The original recipe used the usual cream the butter, add the sugar, then eggs, etc. But because my mixer resides under the counter and is heavy, instead I used the Cuisinart method and it worked fine. So pick the method you prefer, this type of batter is pretty forgiving. Mix all these dry ingredients in the food processor. 1 ½ sticks (6 oz) unsalted butter Add butter and pulse until the butter is in small pieces, but not so much the mix comes together like pie crust. Dump this mix into a bowl. 1 ½ cups dark brown sugar Add brown sugar and mix all these dry ingredients until uniform. 1 tsp vanilla Add eggs and vanilla, and mix until this becomes a very thick batter. It will take muscle power! 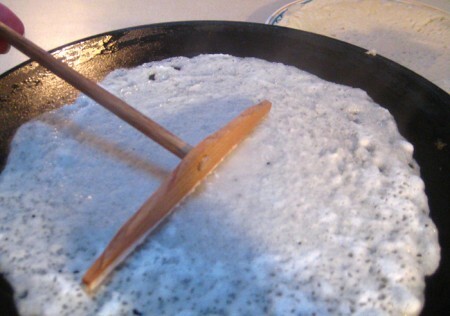 Salt for sprinkling Squish batter into greased 9×13 pan. I used a pyrex so the size was slightly smaller. 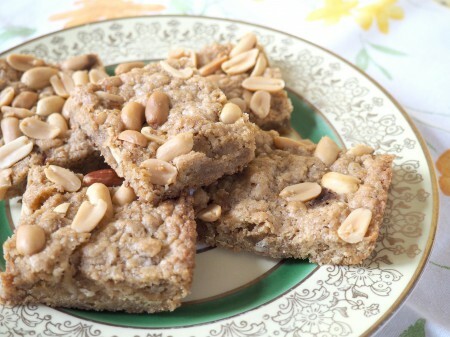 Spread peanuts evenly over batter and push them into the batter a little. Lightly sprinkle salt on top. Bake at 350 for about 20-25 minutes or longer, but this depends on your oven. They are done when the edges are starting to brown and a toothpick will test clean. If you want them really chewy take them out at this stage. If you want a little firmer wait until the edges are darker brown, but these burn easily so I check the bottom of the glass pan to make sure they are not browning too much on the bottom. I keep tweaking this mix. It works well in most recipes where a medium density is the desired result. I use this blend because my husband can only eat small quantities of rice, the main ingredient in most blends. This mix is more nutritious than many of the rice based blends. Lately I have been varying the bean flour part and so far other beans work best if you use two types. In the mix for these brownies I used ½ garbanzo flour and ½ navy bean flour, but routinely I just use Bob’s Red Mill Garfava flour. I use this for pies, cakes, and cookies, and find that I can substitute it in wheat flour recipes by using the same or slightly more by volume. I do mill most of my own flours, which ensures a fresh taste, but purchasing the less well known flours such as Amaranth at a store that has a good turnover will work fine. Amaranth Flour ¼ cup 25g Note: you can mix the proportions of quinoa and amaranth as needed. Some mornings I get up and my dear hubbie has left me a surprise…an empty cookie tin with crumbs in it from my flax muffin tops. This is to signal that I should make more of them asap so he does not suffer without them even one day. When I go travelling alone without him (he does not like to make porcelain dolls, speak French, or play recorder…most of which are connected to my travel quests! )I have to ensure that a supply is on hand in the freezer. There were a lot of flax recipes on the internet, so I tried a few and tinkered a lot, and I have what I think is a very nutritious, gluten free, tasty breakfast bread that can be toasted, can be a vehicle for jam or peanut butter, or my hubbie’s favourite, liver pate (go figure!). They also freeze very well, and easily keep a month, but I can’t proove this because the empty can usually shows up in a few days here at Riverlea. Mix this all up in a bowl. Spoon batter into medium muffin greased muffin top pan. If you really want to get fancy put sesame or poppy seeds in the bottom of the wells first. Let sit at least 3 minutes for the flaxseed to soak up the liquids before baking. Bake 20 minutes at 350. Remove from muffin top pan or at least push them up so they dont get sweaty. Cool and eat or freeze. If you dont have a muffin top pan this also works equally well as a flat bread, just spread out on a cookie sheet so the batter is about scant 1/2 inch think. I’m posting this for a friend, pictures to come later. One of my favourite sweet cookbooks is the Martha Stewart’s Baking Handbook. This book has a wide range of recipes including cookies, quickbreads, cakes, and pastries, lots to satisfy most home bakers. The instructions are clear, and every recipe I have made from it has been scrumptious. As well as many common favourites, there are also a few gems that are not in other books of this type such as sfogliatelle, Spanish olive oil wafers, and Breton biscuits to name a few. This is my favourite cookbook to give to new enthusiastic bakers. 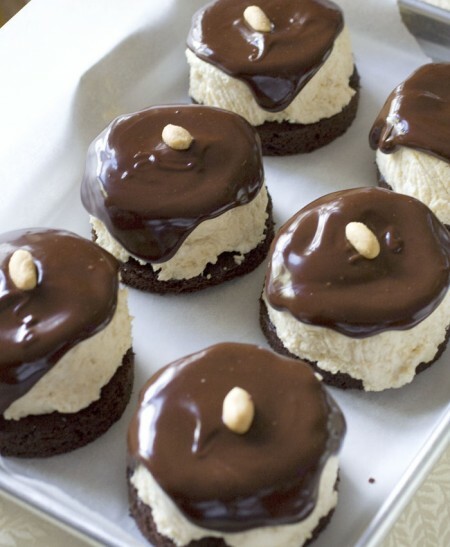 The recipe for icebox cookies is one I return to again and again. 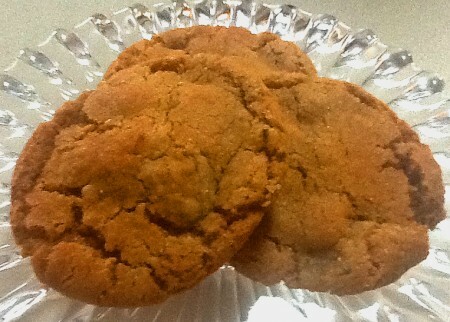 The cookies are a combination of crisp and buttery. Many different flavourings work, as well as the addition of nuts and spices. 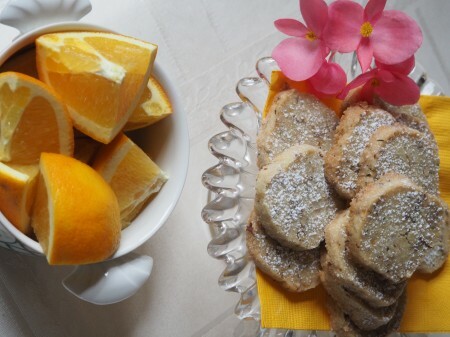 My most recent take on these cookies was to add thyme and orange rind for the spicings. 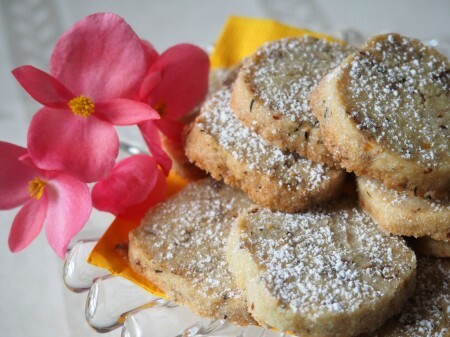 The resulting cookies are semi sweet and go well with afternoon tea or also with cheese for an appertif. After shaping the dough into logs, refrigerate and slice, easy peasy! The texture is the best, like shortbread but with a crunch. The recipe? In the book. 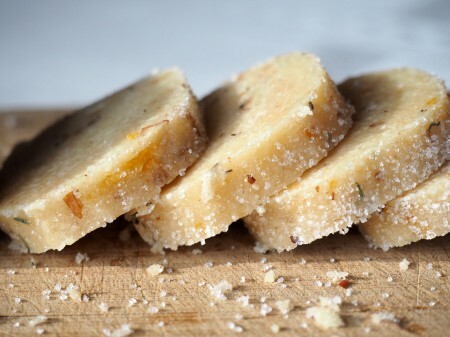 The flavouring is 1 1/2 tsp of thyme, grated orange rind from one orange, and about a 1/2 cup chopped pecans. In April while at my parents house on PEI we had a delicious meal at the Sidewalk Cafe on Main Street in Alberton. The whole meal was delicious PEI style fare, scallops, mashed potatoes, and canned peas, a PEI holdover from before freezers. The hostess, who said she was from Ontario, said they learned quickly that the canned peas were a local favourite. 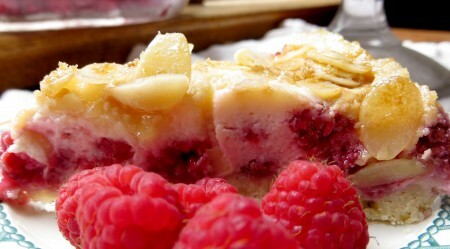 Anyway, my mother told me the raspberry pie was wonderful, so we started sharing a piece. It was so good I ordered a piece of my own right away. 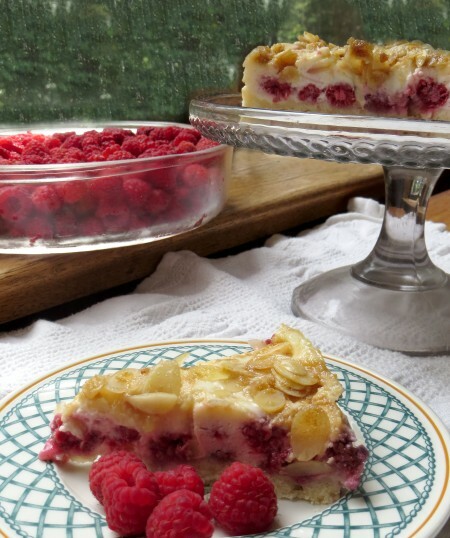 It was just heavenly, creamy, and just a little sweetness so that the flavour of the raspberries reigned supreme. I liked the pie so much that I ended up back there two more times in just the week I was there, wanting to savour the raspberry pie while it was available. I tried a few recipes after returning home to Ontario, but none seemed quite right. Although I loved the pie, I don’t really like regular pie crust that much, so I adapted the recipe for a shortbread type crust. I also didnt have breadcrumbs, so I made an almond topping that turned out to be a great compliment. Here is my recipe. It is divine. The only tricky part is to get the crust cooked, so pay attention when it is in the oven. Mix dry ingredients. Add butter and whirl in food processor until small crumbs evolve. If no processor, then mix as for shortbread with a pastry cutter until small grains occur. Pat into 9” spring form pan. You can try to bring it up the edges a little, or just make it the bottom, depending on the size of your pan. Bake at 350 for 40 minutes or until cooked. Cool pie and then refrigerate as soon as possible. The pie is best after the filling has cooled and set firmly. If you leave it out too long after baking the bottom can get soggy, so try to time this well. These brownies evolved because I’ve been trying recipes with hemp hearts. I found a starting recipe on the site Mum’s Best. Ive tweaked their recipe to use pumpkin instead of applesauce and changes some of the flours. These are delicious. 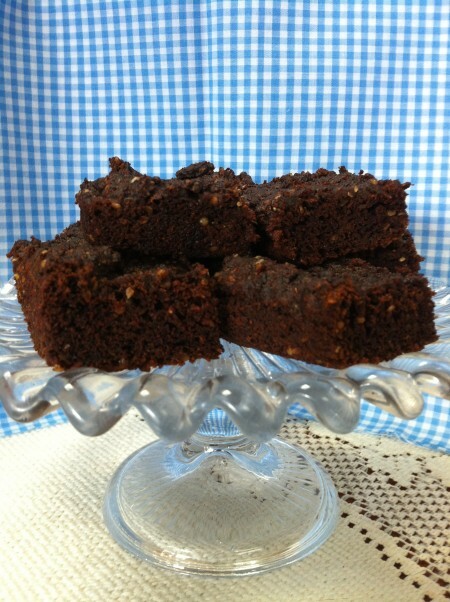 They are a more cakelike brownie rather than chewy. Make sure you use pure canned pumpkin, not pumpkin pie filling. Can brownies really be nutritious? You bet. These have a cakelike texture. They keep and freeze well. Makes an 8×8 square pan of brownies. ½ tsp salt Heat oven to 350 and grease an 8×8 pan. 2 TBL water Add wet ingredients to dry and quickly mix together. The batter will be dense, and you have to work fast because the soda activates right away. Pour / scoop into prepared pan and level the batter mixture with a spoon or offset spatula. Bake about 20 minutes until just done. Like regular brownies they are best not overbaked. This makes about 4 ½ cups, more than needed for the recipe. I have found this to be a good general GF flour mix. It works very well in pastry recipes. Carrot Cake, Not too sweet and also gluten free! Carrot cakes are ubiquitous, and I find many of them to be cloyingly sweet and too full of stuff like raisins and pineapple. I especially hate it with cocoanut for some reason. This carrot cake was supposed to keep the overall feel and spicing, but to be pure carrot cake and only a little sweet. Picture to come after I bake this again and before it gets eaten! I have been experimenting with adding nut and seed mixtures to baked goods after reading Peter Reinhart’s latest gluten free cookbook. He uses all artificial sweeteners, which I generally avoid, so I am sticking with mostly sugar on the premise that you shouldn’t eat too much cake anyway. I have found his cakes a little too fragile, so I have used his approach of the nut / seed mixtures and modified my flour to incorporate more nuts and seeds. Because nuts and seed are higher in fats than other flour ingredients, I have found that reducing fat makes a better outcome. I have made this cake several times now to rave reviews and requests for the recipe, so here it is. I am also trying a few more modifications so I may update this later. Also, don’t be alarmed that after a few hours the carrots oxidize and they look like little green specks. I have usually added buttercream icing on just the top, but the cake is delicious without this as a less sweet nibble with coffee or tea. 1 tsp guar gum Note: all the meal ingredients were ground in my little spice blender. 2 cups grated carrots Cream eggs and sugar until fluffy as you would for any cake. Add eggs and blend until incorporated. Add buttermilk and flour mixture in stages. Add carrots to batter. The batter will be firm and sticky. Place in cake pan, 9” springform or medium rectangular (one size smaller than 9 x 13). If needed wet fingers and press the batter down in the pan. Bake at 350 until it looks well done. The nut mixtures tend to need a little more baking time or they can end up undercooked and soggy. Ice with any buttercream frosting just on the top. I used 1 cup icing sugar to ½ cup butter. The overall effect of this cake should be just slightly sweet. if cooked a little longer. They freeze very well. A note on ingredients, I have been experimenting with using psyllium husk as a binder. What I have found so far is that it really does seem to help with liquid absorbtion and texture. I have been using small quantities so far. I did try a bread recipe with more, and it turned out well. 1/2 or slightly less chopped crystallized ginger Mix dry indredients. 1 egg Mix wet ingredients, then add to dry. Bake at 350 for about 15 minutes depending on your oven. from pan, they are very delicate when hot but firm up when cooled. I have had a recipe for chocolate towers marked for a long time in Emily Luchetti’s cookbook, and finally decided I would make it. After looking over the components, it looked like a recipe that could easily be made gluten free. I also thought the coffee flavouring sounded ok, but since I didn’t have any instant coffee I looked in the cupboard for inspiration and found some peanut butter. Alas the inspiration of a chef sometimes comes from sheer practicality. I made the cake in a rectangular pan and cut out the chocolate rounds. To make the mousse the right size I looked through my dishes and found some souffle dishes that were about the same size. 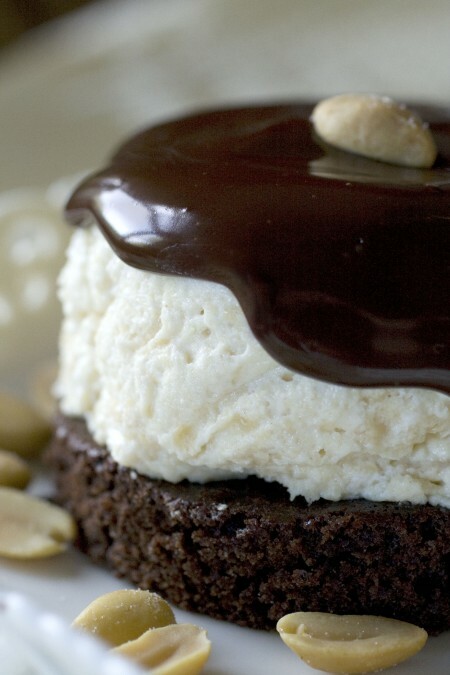 The chocolate topping is sort of like a really thick sauce, so it slithers over the edge just enough before the frigid mouse stops it in its tracks. The chocolate recipe ended up making enough for another batch, so I made this dessert twice in one week. Greg is tired of it now, but it was a big hit until we ate too much of it. This is a really good company dessert because it can all be made even a day before you need it, and even freezes well. 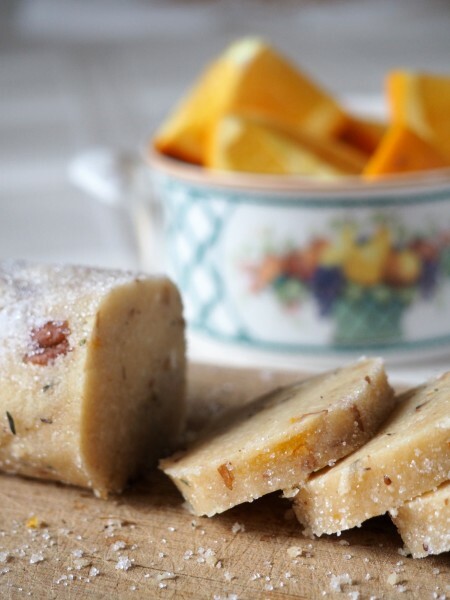 Emily Luchetti has written several cookbooks, and I have found them all great. 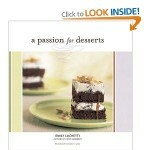 A Passion for Desserts is an excellent cookbook, and has the original Chocolate Tower recipe (non gluten-free). So, with thanks to Emily Luchetti for the inspiration, but the final recipe has been tweaked a fair bit and I am naming it Choco-peanut Tower. Mary, who writes the delicious blog, Mary Mary Culinary was our August Daring Cooks’ host. Indian/Sri Lankan dish to go with the warm flat bread. In the challenge, we could make any of several curries, so I decided to choose the recipe for shrimp curry included in the challenge. I had all the ingredients on hand because I make Indian food frequently. I even had some curry leaves salted away in the freezer, thank heavens for my Toronto shopping trips to Albion and Kipling. I followed the recipe, but added dark chick peas, zucchini, and cauliflour to the pot. The resulting curry was very good, so try this recipe (the full recipes are here: http://thedaringkitchen.com/sites/default/files/u11/28_Appam___Kerala_Cooking_-_DC_Aug_2011.pdf ). I also used my new copper saute pan, and you wont belive it, copper rocks. It heats really evenly and things brown and carmelize, just what you need for a good sauce. Thanks to my son for convincing me of the merits of French copper pots. I have made dosas, a similar batter before. The addition of yeast made the fermentation go faster, so I will try this technique the next time I make dosas as well. The appams are really nice, the fermentation gives them a subtle complexity of flavour. 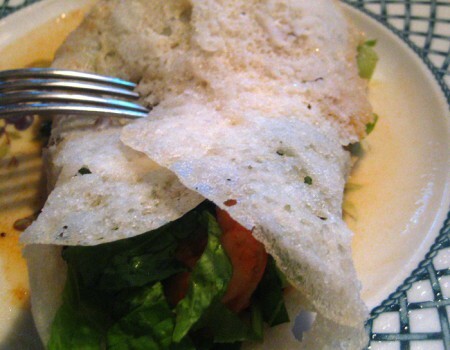 I used my electric crepe maker and used the wooden gizmo to spread the dough around. I love making crepes!! This was a great challenge, and something I had never made before. I really like the Tartine cookbook, and have made several other recipes in it, so I thought the recipe would be tasty. I used the recipes with a gluten free adaptation (explanation below) that worked out well. I have a lovely raspberry patch in fruit right now, so the “Frasier” turned into a “Framboisier” with a few ripe blueberries thrown in. See a very thorough recipe and explanation of the steps here: Daring Bakers Frasier Challenge and Recipes. I used a chocolate ganache for the topping, and pansies for decoration. The final cake tasted great, and looked ok. I would try to have a more dramatic side next time, and strawberries seem to be better for that precise pastry look. I made 4 small cakes just so I could have leftovers that still looked decent. 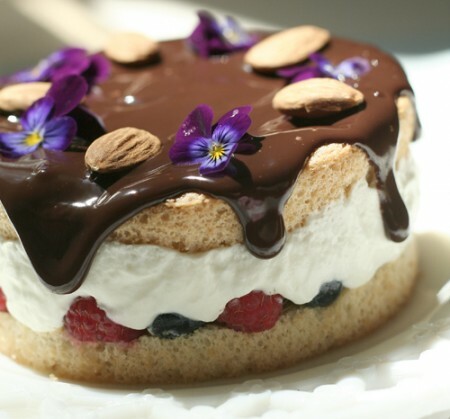 There are pictures on the Daring Bakers site of amazing creativity with this challenge. One of the best parts of participating in these challenges is seeing what others have done with the recipes and concepts. I usually use many flours in gluten free baking, but recently saw a gluten free mix in a magazine called Canadian Family that did not have rice, so I tried it and substituted it for the flour amount called for in the recipe. The resulting sponge cake was delicious, and I will definitely make it again. This makes more than you need, so use it in something else too! The resulting cake was delicious, you really could not tell it was gluten free.